AdBTC is the best bitcoin PTC site with the highest earnings per day. You can earn more than 1000 satoshi per day here which is the highest you can earn compared to all other bitcoin paid to click sites. You will find here the highest earnings and moreover this ptc site is already paying reliably for more than a year! And what is the best – cash out minimum is only 15000 satoshi. You can reach it in 15 days only! You can withdraw to your bitcoin address, e.g. to your blockchain.info wallet. In this guide we will go through everything how AdBTC works, from sign up to cash out. Today I have already viewed all the sites and after 10h I was not on the site I have here another 45 sites for 760 satoshi to view. Great! Now fill up the sign up form. Enter your email – use Gmail!, otherwise you will not receive emails for password change etc. Enter your bitcoin address from Blockchain.info wallet. Create your Blockchain.info wallet here if you do not have yet: https://blockchain.info/wallet. Bitcoin address is NOT your username with dashes! Check Currency, there must be Bitcoin. You can choose also Ethereum if you would ever want to earn Ethereum, with Blockchain.info you have that option. For receiving Ethereum you just switch to Ethereum. At AdBTC we earn Bitcoins so let it at Bitcoin. At Copy & Share Address you will find your bitcoin address which you enter into AdBTC. Press the Copy button, address will be saved to your clipboard and then press CTRL+V after clicking in given field at AdBTC, that is how you paste the address there. Enter your password into the Password field and press Register. Login by clicking on Authorize. Enter email, password, captcha from the image and press Login. 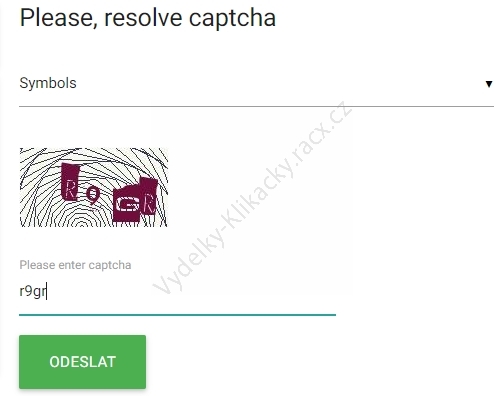 Complete captcha and press Send. Now anywhere on the page find the Open button. It will appear on various positions on the page. Click on it. New window will be opened where the ad runs. Do not close this window, switch back to the first window where the time is running. 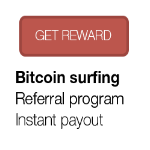 When the time is up your reward gets credited (You earned x satoshis! will appear). The page refreshes and again find the Open button anywhere on the page and continue with another ad. You can close all previously opened pages (except the last one). Continue like this again and again till you see there the text telling you you have surfed all the sites. Then you can come after few hours again, more ads is being added during the day. 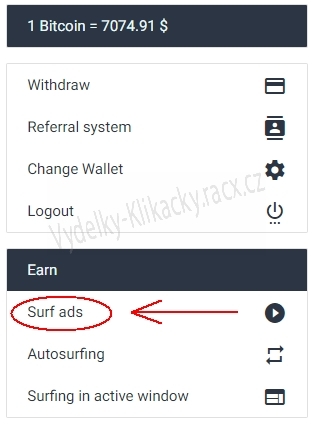 Next option how to earn money here is Autosurfing. Click in menu on Autosurfing. Click on Surf Now or Start Surfing and let it run. Here you do not click the sites 1 by 1, they will be viewed automatically. Close it when you see “You watched all websites for now. Please, come back later, new sites adding several times a day.”. Now click in menu on Surfing in active window. Now you will see a list of ads. Choose one, click on it. Ad will be opened in a new window. Do not close it, let the time run up. The window must be on focus, it must be above everything otherwise the time will not be running. When the time is up choose the image that is the same (that is there 2 times) and click on it. Reward credited, you can close the window and continue with another ad. Another option how to earn and create passive income is to purchase referrals in their Referral market. These are real people, not bots. You can see their statistics how active they are, how much they earned total (Total earned), today (Today earned), how much they have in their balance (Balance), how much they spent on advertising (Spent on advertising), and price (Price). You can buy the referral by clicking on the cart icon. The more active referrals are, the more expensive they are and the more they will earn for you (if they continue like till now). It can happen that active referral will become inactive and also that not much active referral will become daily active. Referrals are people like you so their activity can change, earnings from them are not guaranteed. You can try to buy several referrals. If you would have good results you will buy more. You do not need to buy referrals, you can earn only by viewing ads if you want to. You can refer your own referrals and earn from them. You earn 7.5% from ads they view and 7.5% from their ad purchases. To refer others use your reflink that you will give to your friends etc. They will click on it, sign up and this way they become your referrals and you will earn from them. You can find your reflink in menu under Referral system. You can find banners there too that you can use for promotion – click on Banners. 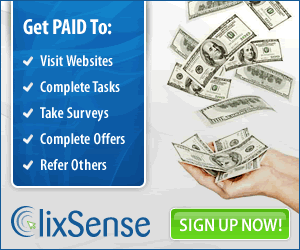 Under all of that you will find the list of your referrals and earnings from them. Your earnings are in the column named You got. They pay to bitcoin address, e.g. blockchain.info wallet. Cash out minimum 15000 Satoshi (satoshi is an unit of bitcoin). You can reach cash out minimum in 15 days. They send payments in 24 hours. 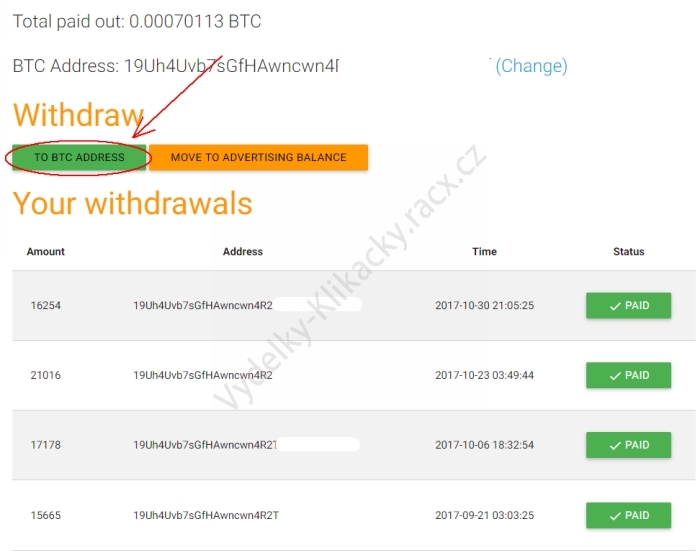 Click in menu on Withdraw. Click on the To BTC Address button. Enter how much you wish to withdraw and confirm. You will receive your payment in 24h to your Blockchain/BTC address.